Ianthe Ruthven is a patient of the practice. She is a photographer who specialises in landscape, arcitecture and interiors. 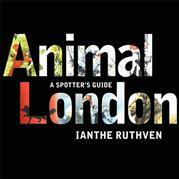 She has publisehed a new book called Animal London by Random House. A synopsis of the book is presented below from the publisher’s website. I have ordered a copy of the book – Ianthe tells me it is for older children so I will have the children have a look at it and hopefully have a review of it shortly. London is full of animals. They are hidden in crumbling graveyards, daubed in canal-bank graffiti, perched atop rooftops. But in the hustle-and-bustle at street-level they are all too often overlooked. This quirky guidebook, with its gorgeous photography, brings to life the animal artworks that give London its unique character. From rabbits, owls, dogs and cats to tortoises, dolphins, sharks and gorillas, a menagerie of creatures inhabits every corner of the capital from Tobacco Docks to Crystal Palace, Bankside to Hackney.They span both ancient and modern too: monstrous medieval gargoyles lurk down damp alleyways, while in a modern urban wasteland there lives a ‘mechanosaurous’ made out of car parts by scrap merchants.